Eagle-Vail’s Mikaela Shiffrin, 18, became the youngest woman to ever win Olympic slalom gold in February (Getty Images/Alexander Hassenstein). In February of 1968, when she was younger than Mikaela Shiffrin is now, Kiki Cutter became the first American ski racer to win a World Cup event. Just two years later, after the 1970 World Alpine Ski Championships at Val Gardena, Italy, Cutter retired at the age of 20 with five World Cup victories – the most wins by an American for nearly a decade. 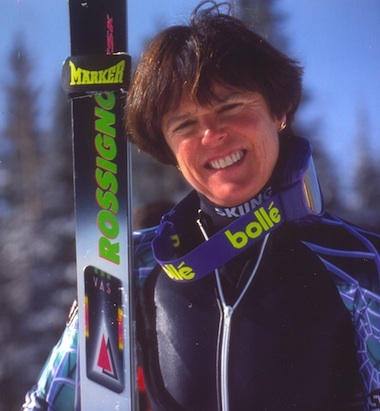 Kiki Cutter, formerly of Aspen, was the first American to win on the World Cup circuit in 1968. Shiffrin, on the other hand, recently turned 19 after an incredible two-year run that’s included an Olympic slalom gold medal, a slalom world championship and nine World Cup victories. The sport’s new superstar, who calls Eagle-Vail home, plans to keep training for next season while studying for the SAT tests and eventually taking college courses. 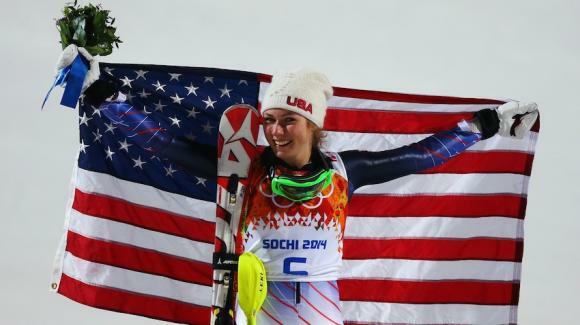 Shiffrin said she’s seriously considered doing what Cutter did – quitting racing to pursue her education. “No, it’s not crazy talk at all. I’ve definitely thought about that, but each time I think about it I’m like, ‘Nope, I’m not done yet,’” said Shiffrin, speaking on a call coordinated by pasta sponsor Barilla, promoting its new “Share the Table” family dining campaign. It would be too hard to take significant time off for college and come back at the same competitive level, Shiffrin added. Shiffrin, unlike Cutter, has the option to do both because of the way the sport has changed so much in 40-plus years. Strict amateur rules prevented racers from taking sponsorship cash in the late 60s and early 70s – one of the reasons Cutter’s ex-husband, U.S. Ski Team founder Bob Beattie, split away from the World Cup circuit he helped establish in 1966 and launched a men’s pro tour. Married to Beattie from 1968 to 73, Cutter raced for a few years on the women’s pro circuit but admits “there wasn’t a lot of money in women’s pro racing, although it was a ton of fun.” Now 64 and living in New Hampshire after three decades in Aspen and another 10 years in her hometown of Bend, Ore., Cutter would have liked a few more years on the World Cup circuit. Cutter went on to great success in the ski industry, working with Rossignol and establishing both a celebrity ski fundraising event and a youth scholarship program in Aspen, but it’s clear the competitive juices were still flowing when she retired in 1970. She said at the time the Europeans enjoyed a huge advantage compared to today. That funding disadvantage and competing pro tours eventually led to changes in amateur sponsorship rules. Now professional skiers compete in the Olympics, and ski racing’s top stars like Vail’s Lindsey Vonn, are multi-millionaires. Those changes have allowed athletes like Bode Miller to contemplate sticking around for another Olympic run in 2018 (for what would be his sixth Games) after just becoming the oldest man to win an Olympic medal in Sochi. In that way, many current World Cup records have to be viewed through the prism of longevity owing to financial security. Vonn, 29, didn’t win her first World Cup race until she was 20, but now she’s claimed 59 and is just three behind Austrian Annemarie Moser-Proell’s all-time women’s mark of 62 career victories. Shiffrin has already won nine times and just turned 19. Cutter thinks Shiffrin can do anything she sets her mind to. I think she’s an incredible athlete and way mature beyond her years. I worry, however, that skiing is really dying. I know #’s can be made to say anything but what doesn’t lie is the fact that the sport has existed on Real Estate revenues for so long. Operating dollars require skiers and boarders. Young people are in such debt from student loans and lack of jobs that dropping a couple of grand to buy or rent skis and go somewhere to ski is just way low on their priorities. Throw into that mix the absurdity of the I-70 situation and it’s a Colorado disaster story. It’s sad because it is an amazing experience….sliding down a mountain on a blue Colorado day. Somewhere it just all went terribly wrong. Perhaps it was the $20.00 hamburger? Well said, Mike. Things have changed dramatically since I was a kid learning to ski on the icy slopes of Blue Knob, Pa. The number of Americans skiing hasn’t grown appreciably since then but the slopes seem more crowded and stressful at times, maybe because there hasn’t been a major new resort since Beaver Creek in 1981. Very insightful of someone as young as Mikaela to recognize there’s a problem and to want to be part of the solution. Rare for 19-year-olds to think that deeply.